No one had any doubt that Prime Minister Narendra Modi would prove his majority in the no-trust motion brought by the opposition on Friday, as numbers were stacked in his party’s favour. As expected, it was never a nail-biting exercise as had been the case with some of his predecessors. But it was the first significant battle on the floor of the house to signal that 2019 is going to be different from 2014 as both sides used the occasion to launch their campaign for next year. Till now, there have been 26 no-confidence motions including the first one against Jawaharlal Nehru in 1963. Lal Bahadur Shastri and Indira Gandhi also faced no-trust motions. Morarji Desai resigned before it reached the voting stage. Very rarely has the opposition won a no-confidence motion. The government has its majority or it can gobble up its majority and the sponsors also know that it is going to be defeated. Three prime ministers had been victims of no-confidence motions. The first was V.P. Singh in 1990, the second Deve Gowda in 1997 and the third was Atal Bihari Vajpayee, who lost in 1999 by one vote. In the present case, the motion against the government was more about the legitimacy of Modi and his government. The idea was to embarrass the Modi government, which boasts about its invincibility and strength. 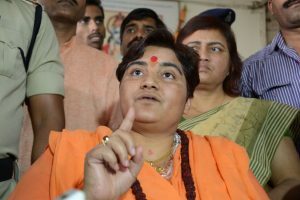 Toppling the Modi government was not the aim of the opposition but it wanted to position itself ahead of the ensuing Assembly polls in Rajasthan, Madhya Pradesh, Chattisgarh and Mizoram and the 2019 Lok Sabha polls. It was a question of how united the opposition stood in taking on the government on the floor of the house and also how united the NDA stood behind Narendra Modi. The Opposition parties were trying to expose the cracks in the NDA and succeeded to an extent. The opposition’s efforts to nudge parties like the Biju Janata Dal to take a firm position ahead of the elections did not succeed. During the Budget session, the TDP had pushed its no-confidence motions demanding special status for Andhra Pradesh. The government had resisted, resulting in the disruption of the entire budget session. BJP chief Amit Shah claims that when the TDP brought the motion in the last session, the BJP did not think it was serious. 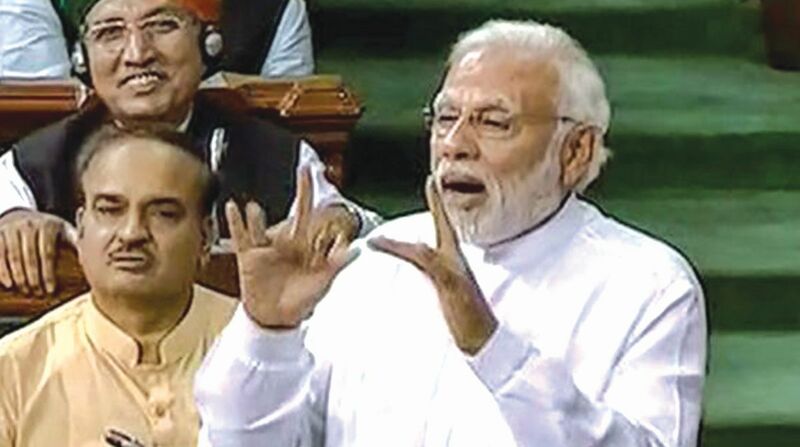 As expected, Modi in his eloquent speech not only ridiculed Rahul Gandhi and the dynasty but also listed his government’s achievements and claimed the opposition had one aim – “Remove Modi”. Rahul Gandhi in his speech not only made strong points about the deficiencies of the Modi Government but also surprised everyone including the Prime Minister by walking up to his seat and hugging him. Rahul and other opposition leaders used the occasion to corner the government on a host of issues. Equating the Modi government to a ‘jumla sarkar’, Rahul used his speech to highlight the plight of farmers, minorities and economy. He made serious accusations against the government on the purchase of Rafale fighter jets from France. Modi too listed his government’s achievements one by one launching his campaign for 2019 on the floor of parliament. Both used the occasion to address the public directly through televised proceedings. After winning the motion, Modi has come out stronger and will use the win as an endorsement of his policies. The opposition too has had the satisfaction of holding the government accountable. However, what came out politically was that the NDA has cracks which need to be addressed by the BJP, as its oldest ally Shiv Sena stayed out. The AIADMK voted with the government while the TRS did not participate in the voting. The BJD walked out. The TDP was happy with bringing its problem to parliament. The lesson for the opposition is that much more needs to be done for unity while the NDA should try to keep its flock together. Now that the trust vote is over, both the opposition and the Government should concentrate on the pending business and bills and ensure smooth running of the house. According to Minister of State for Parliamentary affairs Vijay Goel, 68 bills are pending in the Lok Sabha and 40 in the Rajya Sabha including the Muslim Marriage (Protection of Marriage Rights) Bill, 2017, the Motor Vehicles (Amendment) Bill, 2017, the Constitution (123rd Amendment) Bill, 2017 and the Prevention of Corruption (Amendment) Bill, 2013. Also, six important ordinances await Parliament’s nod including The Fugitive Economic Offenders Ordinance, 2018, the Criminal Law (Amendment) Ordinance, 2018, the Insolvency and Bankruptcy Code (Amendment) Ordinance, 2018 and the National Sports University Ordinance, 2018. The Triple Talaq bill in the Upper House is pending. The opposition wants to send it to a select committee though the Congress and other parties had allowed it to pass in the Lok Sabha earlier where the NDA has a majority. If the opposition and government decide to cooperate, the monsoon session could run smoothly or else it too will be a washout.